You are currently browsing the tag archive for the ‘being in love with music’ tag. A confession: I’ve got the hots for a chick, and have had so for quite time. Of course, she doesn’t have flesh and bones, at least not to me; she’s a voice, a music, and what an extraordinary voice she has, and what extraordinary music she makes. And her most recent album: well, it’s been a long time since I’ve adored an album as much as this, how I’ve learnt every song, as in I’ve become to understand it all, it’s seeped into me, getting beneath my skin. You know when you’re young and you listen to an album so often that you start to become sick of it? So you wisen up and get into the habit of drip-feeding albums that you’re loving. Or you love an album immediately only to find that it doesn’t hold its own ground. Or you don’t like an album immediately, but soon find yourself playing it over and over, loving it intensely, obsessively, until it’s all-consuming. PJ Harvey’s most recent album Let England Shake is the sort of album that makes me remember the great records from my deep, dark past – Faith by The Cure, London Calling by The Clash, The Queen is Dead by The Smiths – and I do own this latest Harvey opus on record, as in on vinyl, because that’s how I like to listen to the best albums that come my way. 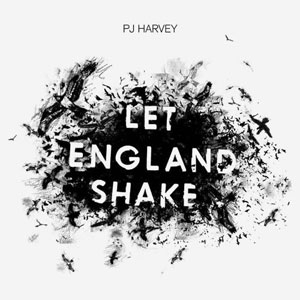 Despite being an age-old though not uncritical PJ Harvey fan, I’ve come a little late to Let England Shake. It was recorded over a five-week period at a church in Dorset UK in April and May 2010 (when I was bunking down in Launceston Tasmania, I realise rather deliciously) and released later that year. In 2011 Harvey won the coveted Mercury Prize for this record, making her the only musician to have bagged the honour twice; she’d previously won it for Stories from the City, Stories from the Sea back in 2001. What makes Harvey such an exciting, beguiling, and sometimes, let’s face it, frustrating singer-songwriter is her dogged refusal to repeat herself (Tim Winton should take notice, in more ways than one). Her albums have covered such various terrain as riot-grrl grunge, folk, pop, electronica, sparse piano ballads (check out 2007’s White Chalk), and now she adds a dozen war songs to her, er, canon. Harvey wrote Let England Shake over a two-and-a-half-year period, producing the lyrics first – she claims to be inspired by Harold Pinter and TS Elliot – before sitting down to set the lyrics to music. Her mission, it’s clear, was to explore what it means to live in a country that’s at war. However, this isn’t some table-thumping polemic; it’s intimate, it’s beautiful, it’s harsh, it’s haunting. Her voice is higher than on previous records, and it’s complemented – more than appropriately – by the deep timbre of her long-time collaborators, John Parish, who Harvey has described as her music soul-mate, and Mick Harvey (no relation), who for many years has worked with Nick Cave. Using instruments as diverse as autoharp, zither, piano, trombone and saxophone, as well as some cheeky and downright hilarious samples, Harvey has crafted an album that is as engaging as it is adventurous. And it’s packed with tunes; it would almost be thigh-slapping good fun if it the subject matter wasn’t so serious. Check out ‘The Last Living Rose’, the gut-wrenching ‘On Battleship Hill’ and ‘Written on the Forehead’ to experience the musical and emotional range of the album. It’s true that PJ Harvey can be awkward company: I imagine that you’d have a delightful cup of tea with her, she’d smile, she’d talk sweetly but with brutal honesty, before she’d stand up, excuse herself, and go and play with her chooks or pot up some salvia. And I haven’t always been faithful to her; in fact years have gone by when I’ve not had much to do with her. But, despite the latest fixation on how ugly human beings can be to each other, how supremely violent for no real logical reason, we’re back together now. And I feel that this time she’s with me for quite some time. Even if she does a runner on me again, or I do a runner on her, I have no doubt that in twenty years time I’ll still be playing Let England Shake, and on vinyl, and loud, very very loud.